O.J. Simpson is seen with his Heisman Trophy. 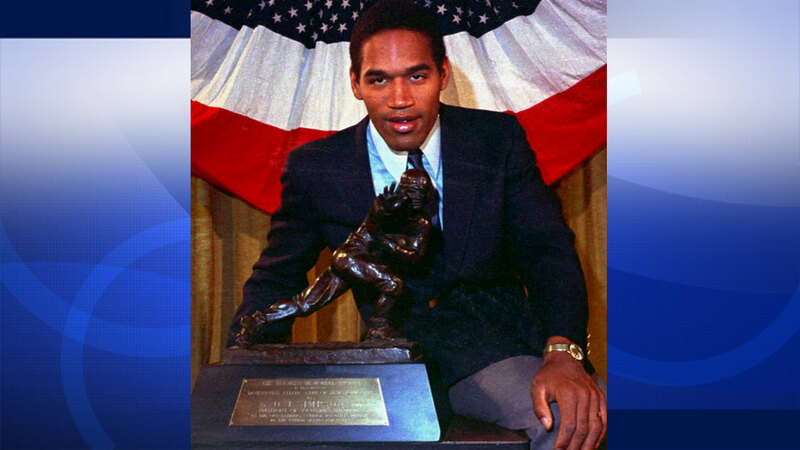 LOS ANGELES -- A Heisman Trophy honoring O.J. Simpson has been found more than 20 years after it was stolen from the University of Southern California. On Dec. 16, 2014, detectives assigned to the Los Angeles Police Department's art theft detail recovered the trophy. The trophy, along with a jersey worn by Simpson, were on display in the lobby of Heritage Hall at USC. The item was stolen during a burglary on the USC campus on July 28, 1994. A custodian working on campus reported the crime. The trophy recovered is a duplicate given to USC, not the original trophy awarded to Simpson. The duplicate is in police custody and the investigation is ongoing. Anyone with information on the burglary, or the whereabouts of the jersey, is asked to contact the LAPD art theft detail at (213) 486-6940. Those wishing to remain anonymous can contact "Crime Stoppers" at (800) 222-8477. Tipsters may also text "LAPD" and information to 274637.